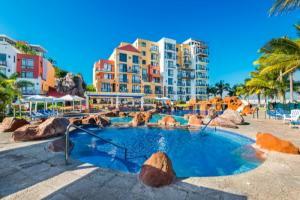 El Cid Marina Beach - Mazatlan, an oceanfront Mediterranean-style hotel, with 200 suites, is located on its own marina. Enjoy the peace of its secluded beach and lounge in one of the two pools that feature underwater caves, a swim-up bar and Jacuzzi®. Guests can enjoy all the facilities of any El Cid Resort via a free shuttle. Located about 1 mile north from the other El Cid hotels in the Hotel Zone, 35 minutes from the airport.